This time of the year is always the toughest part of the season for spring coaches, the April break. Just when things are starting to click, the teams head into a week-long vacation and coaches can only hope their athletes stay on top of their training. The Titans track team had it especially hard as they prepared for their final meet of the season before the break as several athletes would miss the meet on Saturday, April 8 due to ACT testing. 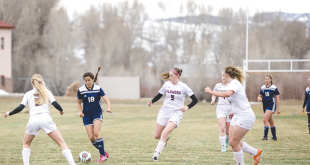 Nevertheless, coach Laura Daniels has numerous underclassmen on the team and while the entire junior class was absent, she and assistant coach Anne Wiese did have 18 Titans as they headed to a new meet in Salida to get a look at the bigger picture in the 2A class. While the Titans’ limited numbers meant relays were nearly non-existent, the kids could shine in their individual events and the Titans made the most of it. Josh Merck continues to gain speed in the sprint events, most notably the 200 meters as Merck set a new PR in the 200 meters to place fifth in Salida. The boys team got a boost to their mid-distance runners as Tristan Davis lined up for his first race of the season and finished ninth in the 400 meters. “That was pretty fast for his first 400 and was exciting to see,” says Daniels. The highlight of the day among the boys came from Joe Coburn. Coburn set a new PR in the two-mile with a time of 11:08.73, shaving 35 seconds off his previous time to finish in third against runners from bigger programs. “He ran super-smart and showed incredible maturity as an athlete,” says Daniels. Tate Young appears back on track in the jumping events with his effort in Salida setting PRs in both the high jump and triple jump to place fifth and eighth, respectively. With junior distance stand-outs Maria O’Neal and Sydney Petersen missing due to testing, Keely Olson led the charge for the girls team. Olson posted her best long jump of the season and finished fourth in the 300-meter hurdles, setting a new PR. “She’s just really impressed me as an athlete,” says Daniels. Meanwhile, Hope Freeman is gaining ground in her sprint events. “Hope continues to get faster every week,” says Daniels. Now, it’s break time for the team as they are all on vacation returning to workouts on Monday, April 24. While the hope is that they follow the training programs the coaches laid out for them during the week, the proof will come as they return to action with their next meet in Montrose on Friday, April 27. 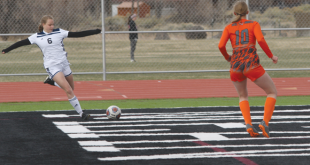 Whether or not they are ready for Montrose, Daniels and Wiese have the bigger picture in mind for the second half of the season. Following Montrose, the Titans have just two more meets before the state championships May 18-20.